North America (Spanish: América del Norte or Norteamérica; French: Amérique du Nord) is the northern continent of the Americas, situated in the Earth's northern hemisphere and in the western hemisphere. It is bordered on the north by the Arctic Ocean, on the east by the North Atlantic Ocean, on the southeast by the Caribbean Sea, and on the west by the North Pacific Ocean; South America lies to the southeast. 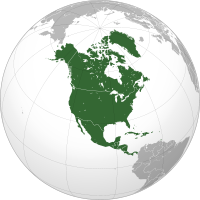 North America covers an area of about 24,709,000 square kilometers (9,540,000 square miles), about 4.8% of the planet's surface or about 16.5% of its land area. As of July 2008, its population was estimated at nearly 529 million people. It is the third-largest continent in area, following Asia and Africa, and the fourth in population after Asia, Africa, and Europe.